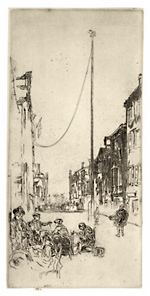 The Venetian Mast - - 1880, Etching and Drypoint. Kennedy 195. Edition unknown. Signed with the butterfly in pencil. Image size 13 3/8 x 6 3/8 inches (340 x 162 mm). A fine, rich impression, in dark brown ink, on cream laid paper, with the margins trimmed to the image edge, as was the artist’s custom; in excellent condition. Collections: The National Gallery of Australia,The Jacobson Collection of American Art. 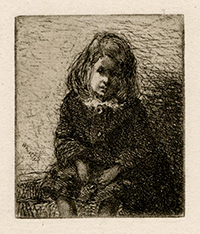 Little Arthur- - 1857-58, Etching and Drypoint. Kennedy 9. Edition 61, 4th state of 4. Signed in the plate, lower left. Image size 2 5/16 x 1 15/16 inches (58 x 48 mm); sheet size 4 1/2 x 4 3/8 inches (114 x 111 mm). A superb, finely detailed impression, in dark sepia ink, on off-white laid paper, with full margins (1 to 1 1/4 inch); in excellent condition. Included in the French Set, 1858. 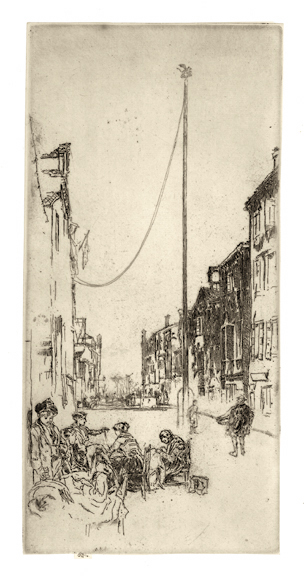 On one impression Whistler identified the boy as Arthur Haden—Arthur Charles Haden was the younger son of Whistler’s half-sister Deborah Delano Haden and Francis Seymour Haden, Sr. 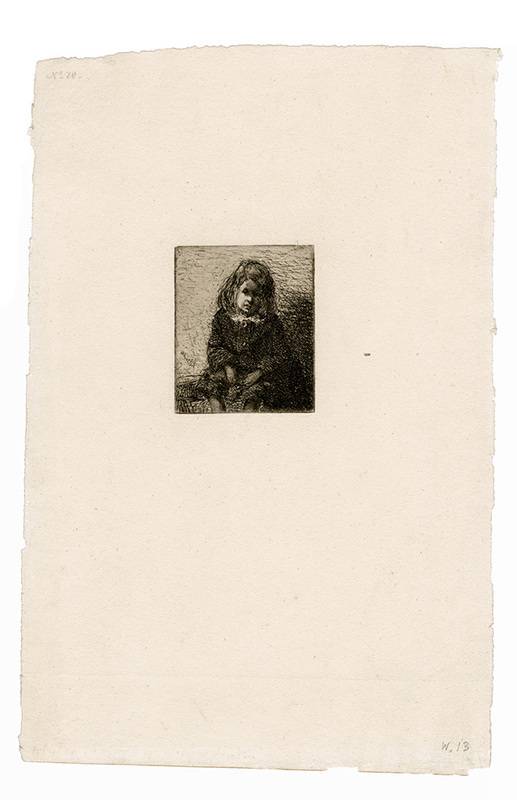 This is one of a series of portraits of their children by Whistler which includes Seymour, Standing; Annie Haden with Books, and Annie. Provenance: Gage Gallery, Cleveland; John Bower Rhodes (acquired 1928). Collections: Art Gallery of New South Wales; Baltimore Museum of Art; Bowdoin College Museum of Art; British Museum; Carnegie Museum of Art; Colby College Museum of Art; Cooper Hewitt, Smithsonian Design Museum; Grace Museum; Metropolitan Museum of Art; National Gallery of Australia; Smart Museum of Art, University of Chicago; University of Iowa Museum of Art.